Top Four Decking Accessories in Randolph NJ – New Jersey Siding & Windows, Inc.
Summer is upon us, which means family gatherings, delicious barbecues and boozy brunches. There is no better place to spend a beautiful, sunny summer day than your gorgeous custom deck from New Jersey Siding & Windows, Inc. Once your deck is built and ready for your enjoyment, go one step further to making it even more personalized and inviting by accessorizing your space. Comfortable and stylish furniture is one of the first purchases you will want to make to get the most out of your new or revitalized deck. Furniture should be all-weather, easy to clean and maintain. You will want to invest in a table large enough to accommodate several family members or guests, plenty of seating, and pieces that could serve multiple functions like benches or ottomans. Choose tones that accentuate the natural beauty of the outdoors, and don’t be afraid to add a pop of bright or bold color either with seat cushions or accent pillows. Decks are certainly not just for daytime use, and adding lighting not only makes your deck cozier and more inviting, lighting makes your deck safer as well. Lights should be installed near steps, high-traffic areas, posts and rails to ensure that no one stumbles or falls while walking. Accent lighting creates a softer, more subtle illumination, while recessed lights are brighter and designed to cover more area. Recessed lights are installed lower to the ground, and are considered uplighting, unlike accent lighting which has a more elevated positioning and is called downlighting. One of the most important things you can do as a deck-owner is to actively work to keep flies, mosquitos and bees away from your outdoor living space. A bug free barbecue or brunch is so much more enjoyable than spending your day swatting flies away from food, scratching mosquito bites and running from bees. Citronella is your first line of defense, and burning a combination of torches and candles can be helpful especially against mosquitos. Other options include essential oils, and certain herbs such as garlic and rosemary. Installing ceiling fans can also be a deterrent for bugs, and spraying either a mixture of water and hydrogen peroxide or a combination of mouthwash and water over surfaces like tables and chairs can also be helpful. Whether it is water or beer you’re searching for, there is nothing like an ice-cold drink on a hot summer day. 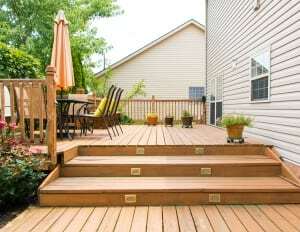 You will certainly be able to enjoy your deck three seasons a year, though, vastly increasing the number of days you will be able to savor your outdoor retreat, making easy access to beverages a great investment and a definite convenience. You can opt for an outdoor refrigerator that can be installed onto your deck, or something a little more cost effective like a large but stylish cooler. An outdoor cooler can be purchased as is, or a DIY wooden cooler would be a fun personal touch. Make sure you frequently replace the ice, and always stock everyone’s favorite drinks! Now that you know how you can accessorize, call New Jersey Siding & Windows, Inc. to get started on building or revitalizing your dream deck.